DP2 Environmental Systems & Societies students experimenting with a 15 W PV panel. Like other parts of the planet there are significant developments in solar energy generation in Sri Lanka. The costs of photovoltaic (PV) panels have come down and net metering allows small operators to export their power to the grid built and maintained by the Ceylon Electricity Board. After many years of reading about the solar revolution it has been thrilling to have a colleague install a system at her house. Encouraged by these developments, OSC’s DP Environmental Systems and Societies (ES&S) students are investigating the basics of PV-generated energy. It has given me a chance to brush up on power and energy concepts as are applicable when talking about the generation of renewable energy. My personal interest in energy goes back to my father Merrick Lockwood who has been working with alternative energy projects since the late 1970s. His significant work was on a biomass-fueled Stirling cycle engine that produced power to run a rice mill. You can about the joys and tribulations of his work in Bangladesh in How I Built a 5HP Stirling Engine (it is an intriguing account narrating the Rice Husk Energy project though the title was not Merrick’s choice). Stirling engines were a major focus point but Merrick has always been interested in an array of conventional and non-conventional energy technologies. I have strong childhood memories of PV cells, batteries, meters and literature on renewable energy in the wonderful clutter of his office and workshop. Earlier this year my alma mater KIS installed a 2 kw set of panels though the tireless work of Class of 1952 alum Dr. Clarence Maloney. His efforts helped get me thinking about solar energy as a viable option. Sri Lanka sits in an enviable location to tap into renewable energy. Because it is so close to the equator (6°-9.5° N) it is bathed in insolation (solar irradiance) throughout the year. 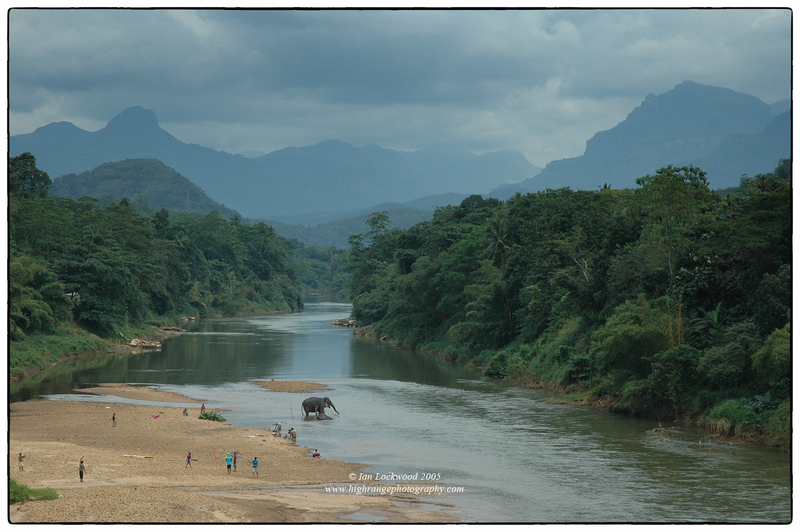 Sri Lanka is blessed with high rainfall in its “wet zone” and here it taps into large and medium-sized hydroelectric schemes which generate about half of all the electricity use in a year. Sri Lanka’s coastal areas offer great potential for wind power generation (something being explored in the Kalpitiya region). Biomass fuel provides for much of the country’s cooking needs in rural areas and if managed correctly can be a sustainable energy source. At the moment Sri Lanka’s electricity demand is growing and it gets significant power (up to 40-45%) from thermal plants burning heavy oil and coal. The chart below shows the source of electricity on 16th November 2015. Because of the high rainfall in the catchment areas there is optimal hydroelectric production (68% of the total). The catalysis for my current interest interest in solar energy at OSC was my colleague’s Chamilla Ratnaweera decision to install an array of PV panels on her rooftop in July this year. She and her husband have sixteen 0.46 m2 panels for a total of 23.36 m2. They have a net-metering arrangement, which means the power that they generate goes straight into the grid and runs their meter backwards (“exporting” units on their bill). When they draw power (it is mostly at night and on weekends) the system takes electricity from the grid. Not having batteries and having to deal with the storage of solar generated electricity simplifies the process in net metering. It assumes, of course, that there is functioning electricity grid. In September Chamilla’s panels produced an average of 14.3 kWh of solar energy every day (see graph below) and they have not paid an electric bill for the last three months! What is even more remarkable is that have also purchased a Nissan Leaf eclectic car and are able to charge the vehicle and meet their electrical energy requirements with their panels! Chamilla has access to daily, monthly and yearly data on solar energy generated (in kWh). There are several companies offering schemes and they purchased their set up through Solar Edge (marketed here by JLanka Technologies). According to their company literature a similar set with installation costs roughly LKR 1.1 million (US$ 7,700). Our class has been checking on her daily power generation every day for the last two weeks. Graphs showing solar production in kWh generated at Chamilla’s home in September and October 2015. Even though these were relatively wet months the system generated 430.4 kWh in September and 468.87 kWh in October. 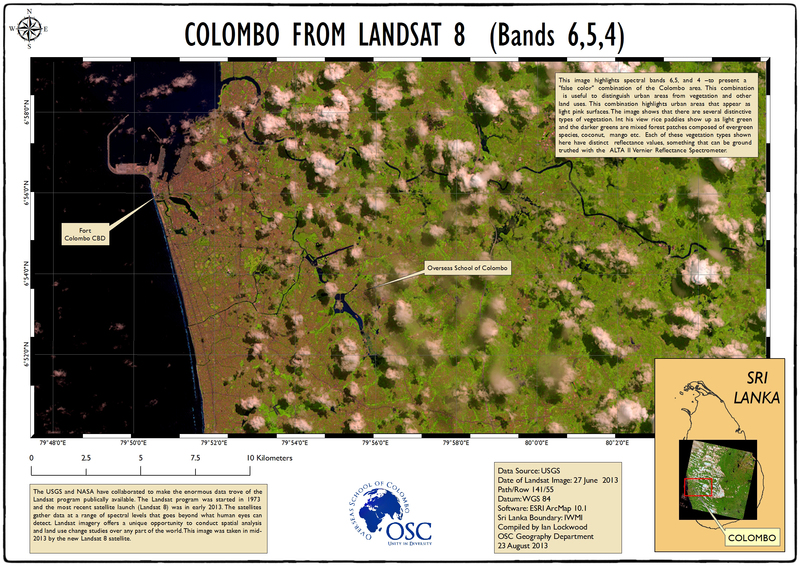 As a part of this study I visited the Sri Lanka Department of Meteorology on November 6th. On this initial trip I had several interesting discussions with the meteorologists who run operations and I was also able to purchase solar radiance and rainfall data. The graphs below chart solar radiance (in MJ/m2/day) against the solar energy generated by Chamilla’s panels (in kWh/day). Other than the days where there was maintenance on the panels there is a clear pattern between radiance and solar energy generated as one would expect. Chart showing solar energy generated vs. solar radiance as recorded by the Sri Lanka Meteorology Department. Noe that at the beginning of the month the panels were not running at their full potential. They were serviced on September 22nd and 25th. There is 5-10 km between the two locations where the data was recorded, which may partly explain discrepancies. Chart showing solar energy generated vs. solar radiance as recorded by the Sri Lanka Meteorology Department for the month of October. Like the graph above the energy generated follows the pattern of the solar radiance. The data from October 9th and 27th was originally missing and I have substituted near values. To better understand solar energy the class tested a small 31 x 37 cm 15w panel that the Physics class purchased last year. Will Duncan, the Head of Science, gave me a primer and demonstration on how to rig up the voltage and current meters and make calculations on energy generated by the panel. We are using Vernier’s Labquest2 devices and these are versatile data loggers that allow students to gather raw data from a variety of probes. This year we purchased the pyranometer probe, which measures irradiance (in w/m2) and allows you to then calculate the efficiency of solar panels. I ran trials with the Labquest simultaneously taking in data from three probes (voltage, current and irradiance). The raw data is then imported into Loggerpro where power and efficiency is graphed and analyzed. Measuring electromagnetic radiation (irradiance) (in w/m2) over the course of the day in our Colombo neighborhood. The results are given below. Graph showing irradiance data gathered over a 12 hour period at our home in Battaramulla on November 7 2015. The Labquest2 with the pyranometer gathered data every minutes for 12 hours (720 minutes). Map showing annual irradiation (radiance) levels in kWh/m2 draped over an elevation model (sourced from the amazing website SolarGIS). Both Sri Lanka and southern India have optimal conditions to tap into solar energy! Weather is obviously a major factor in producing solar energy. We have just experienced unseasonably wet months in September and October. In fact his last Sunday- an overcast, gloomy day that experienced rainfall for much of the day- Chamilla’s panels generated 6.89 kWh of solar energy! That is lower than the 14.34 kWh September average but still significant. We have not yet done a full cost benefit analysis of the panels but it is quite clear that they pay for themselves quickly. If the electricity bill was roughly LKR 25,000 a month, the system would pay for itself in under four years. The company, like many here in Sri Lanka, is advertising the system to have a 25 year lifespan. If you are a house owner or run a large institution, such as a school like OSC, investing in a PV systems makes both sense for the climate and your wallet. Sun or shine, there are ample opportunities to generate solar energy on OSC’s many roofs. With net metering the school could potentially offset its high monthly bills. In the next post I’ll explore rainfall data in these last few months in order look at patterns and changes from past years. Biello, David. “Less polluting energy sources are proliferating in the U.S. If other nations join in, the results could have global impact.” Scientific American. 18 November 2015. Web. 24 November 2015. Jayawardena, Dulip. “Potential for renewable energy in Sri Lanka.” Sunday Times. 31 October 2010. Web. 14 November 2015. NASA. Global Maps: Net Radiation. Web. 17 November 2015. NASA. Net Radiation (1 Month). Web Data Portal. 17 November 2015. Plank, Alexandria R. et al. Renewable Energy With Vernier. Vernier, 2012. Print & Web. Renné, Dave et al. 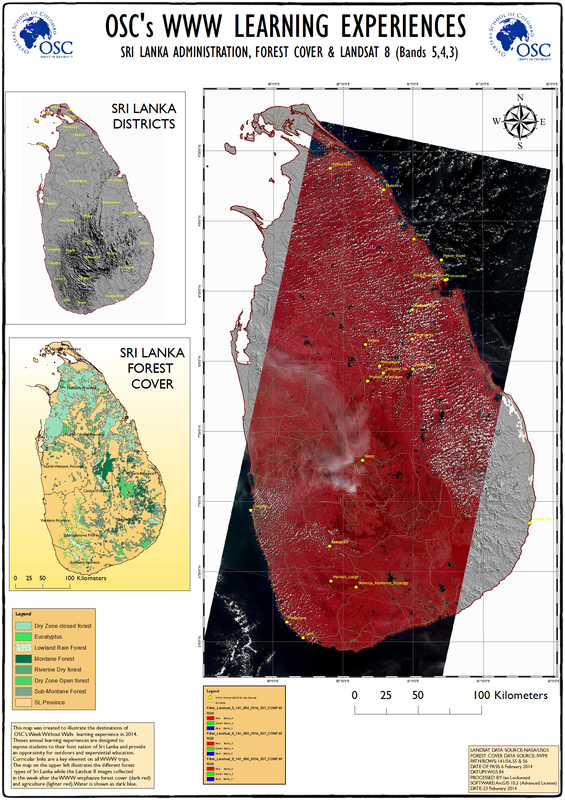 Solar Resource Assessment for Sri Lanka and Maldives. Boulder, CO: National Renewable Energy Laboratory, 2003. Web. 14 November 2015. Renewable Energy for Rural Economic Development Project-Sri Lanka. Web. 13 November 2015. Rodrigo, Chatura. “The Road to Becoming an Energy Independent Country: Can We Deliver?” Talking Economics. 5 August 2015. Web. Solar GIS. Irradiance Portal. Web. 14 November 2015. Sri Lanka Sustainable Development Authority. 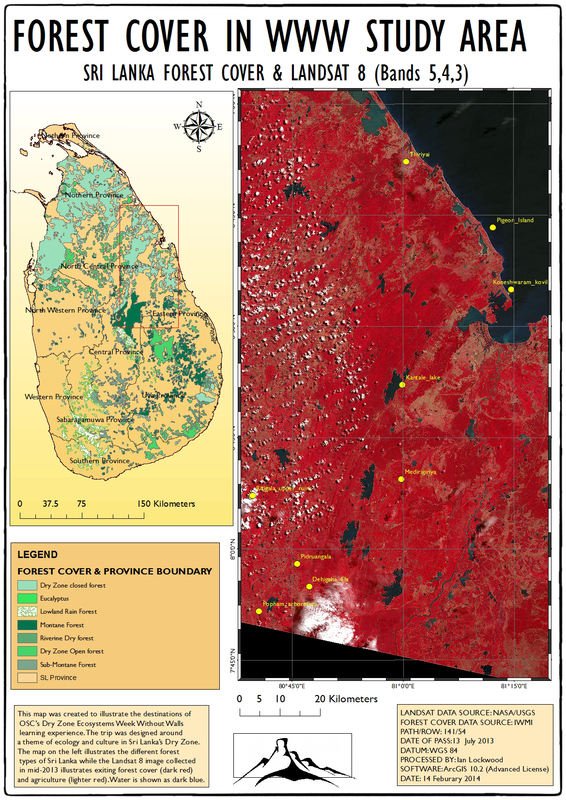 Solar Resource Atlas of Sri Lanka. Web. 14 November 2015. Sri Lanka Sustainable Development Authority. Sri Lanka Energy Balance 2007: An Analysis of Energy Sector Performance. Web. 14 November 2015. Kelani River looking east at the bridge near Karawanella. Taken in 2005 on one of the author’s first visits to the river. The basin due east of this point (center of image) is what surrounds Kitulgala. Every year at the beginning of the school year we take OSC’s new DP1 (Grade 11) students on a three-day experience to initiate them into the IB Diploma Program. 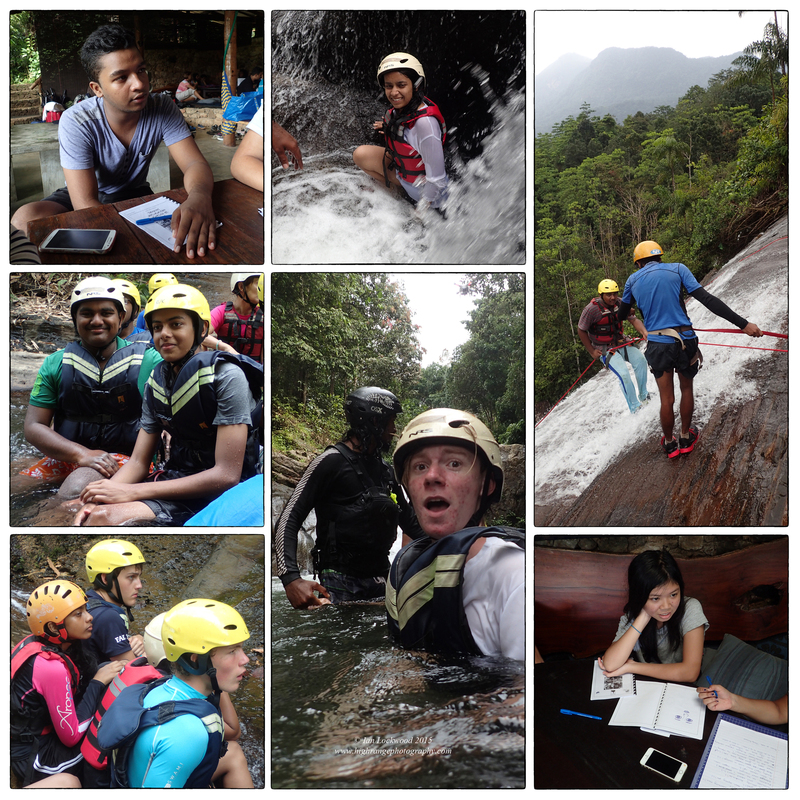 The river-the Kelani Ganga-serves as our teacher and home as we work to build a team that will work together to meet the challenges of this rigorous academic challenge over the next 18 months. Much of the program involves physical and mind challenges set in the wet, densely forested Kelani River valley near Kitulgala. The Kelani Ganga is an important river in Sri Lanka. It is not the longest (that distinction goes to the Mahaweli Ganga) but it is important as the main river that flows through (northern) Colombo to the Indian Ocean. The Kelani begins its seaward journey in the cloud forests of Sri Pada (Adam’s Peak) and flows eastwards through Maskeliya, Laxapana, Kitulgala, Hanwela, Kaduwela, Kelani and out to the ocean just north of the port of Colombo. It drains one of the wettest areas of the Central Highlands and thus river discharge is very high. In its higher reaches several large hydroelectric schemes dam the river and provide power to the Ceylon Electricity Board. These schemes help contribute to Sri Lanka’s nearly 50% generation of all power through hydroelectricity. However, a new 35 MW dam has been planned and is under construction just upstream of Kitulgala. It will potentially adversely affect the white water rafting industry (see the article links below for further details) and destroy a key canyon that has become a prime destination for low impact tourist adventure tourism. The Kelani became famous to much of the world in the 1950s when it was used as set for the Academy award-winning Bridge of the River Kwai. The movie set included a real steam engine being blown up over a life-size bridge straddling the Kelani river just east of Kitulgala town. To this day the romance of the movie is played up at the Kitulgala Rest House where pictures of the actors and actresses adorn the restaurant wall. Actual remnants of the movie set are non-existent though a sign points visitors down to the river at the former bridge set. Scenes from the Kelani. (Above) Laxapana falls-beautiful but actually severely reduced in flow by upstream water diversions. (Below) Passengers crossing the Kelani near the Kitulgala Rest House. We have designed the IB Orientation program to take students straight from the busses into the cold metaphorical waters of the Kelani. Water and the river play a key role as students and teachers raft and canyon their way into the camp on the first day. The team at Borderlands has an excellent safety record and time is taken to emphasize safety in the different spheres of the challenge. Some of the students have been here on past school trips or with their parents but a few came with limited swimming skills and were nervous about the challenge. We rafted through a series of rapids, took time to play in the river and then made our way through a gorge (“the Canyon”). The Class of 2017 was joined by secondary principle Eileen Niedermann, DP coordinator Tim Getter, TOK teacher Laurence Mueller, guidance counselor Rosanne Noble and myself (CAS Coordinator). By the end of the first day the team was exhausted, but exhilarated from the river and canyon. We took time to reflect on the day both as a group and individually. This is where CAS came in and the four step learning cycle (plan, act, observe, reflect) was emphasized (The new IBDP CAS Guide uses a modified five stage cycle based on Catheryn Berger Kaye’ s Five Stage of Service Learning). The unique opportunities that students have in building leadership skills are an in important part of this program. This is a key feature of any Borderlands youth experience/camp and a goal in our own OSC orientation programs. Skills that students build in these programs serve them for life, something that I have seen in my many years here. Numerous OSC students have worked at Borderlands after graduating and it is gratifying to see them quickly transition into very capable, safety-minded guides. Olivia Molden, Jason Staeck, Margret Watts and several others have all had impressive life experiences working at Borderlands. This year John Fredericks (who graduated in the Class of 2015) was a supporting guide working with the Borderlands team. He proved to be a clear communicator, fine role model and first class river and canyon guide. John relished the reversal of roles on the abseil where he commanded and then supported teachers (and students) as they descended the falls and had to swim across a deep pool of moving water while still harnessed to the rope. For the Class of 2017 students a majority of them were given key tasks to help with guiding our group to a safe, successful conclusion. They thrived even though at times the perceived risks (scare factors) were considerable. Collage of OSC’s Class of 2017 students on IB orientation. Students negotiating the “canyon.” Several of them had an opportunity to take on leadership roles that helped the team safely navigate the slides, jumps and pools. This is a beautiful area now at risk from plans to run a large pipe down the gorge to a hydroelectric generating plant. OSC’s Class of 2017 after passing through the upper and lower canyon. The Theory of Knowledge (TOK) component of the orientation program is set in the historical Belilena Cave located amongst rubber plantations above Kitulgala. This is a significant Sri Lankan archeological site and is thought to be one of the oldest locations showing evidence of early Homo sapiens in all of South Asia (estimates range from 12,000 to 30,000 years before present)! The setting is sublime and with a little imagination it is possible to imagine a very different scene so many years ago. The students were invited to think about knowledge and test their senses as they grappled with a series of cognitive challenges. In the second part of the afternoon the tasks were much more physical and the class hiked up to a 100-meter waterfall to be tested in a slippery abseil. The skies opened up on the second group but almost all of our team was able to do the abseil regardless of the weather. We wrapped up the day with reflection and then free time. On the final morning OSC’s service coordinator Amanda Lenk led the group in an activity to learn about the stories of the people of the river. Small groups fanned out with Borderland’s guides to listen and interact with a variety of individuals who are from different strata of Kitulgala’s community. The stories that we listened to and recorded are part of an effort to help our students better understand the broader human community outside of their normal spheres of interaction. 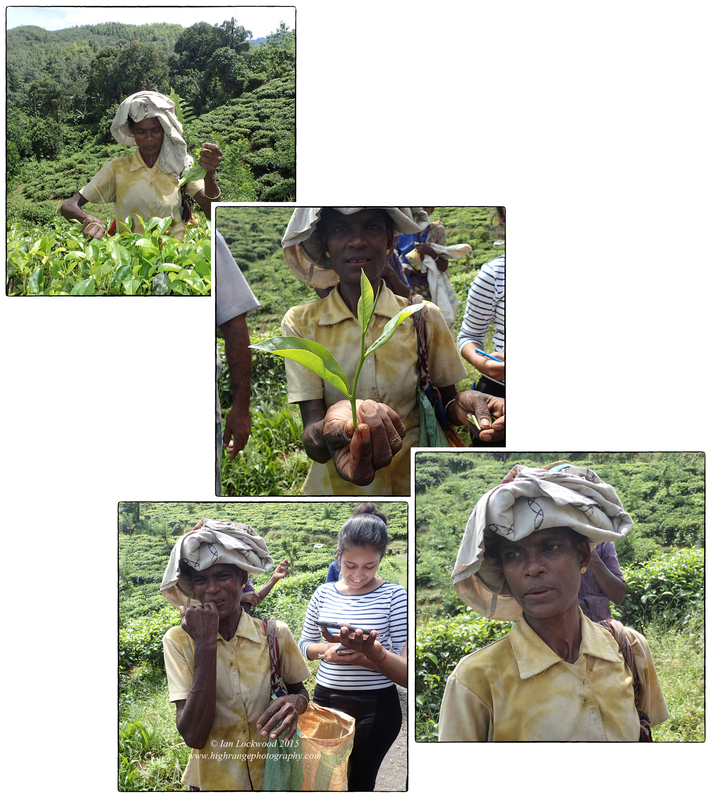 Series on a tea planter being interviewed by OSC students near Kitulgala. Landscape above Kitulgala looking west down the Kelani Valley. 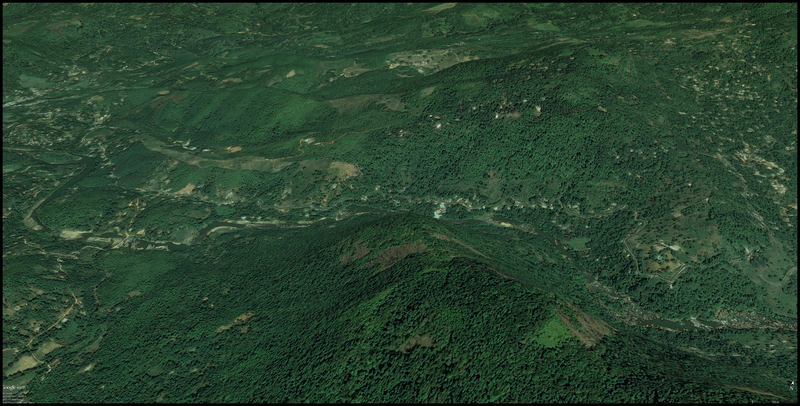 The image highlights rubber plantations (to the left) and land being prepared for tea cultivation. The original vegetation in this area would have been lowland tropical rainforest. This panorama was taken during the 2013 IB Orientation. People living in the Kitulgala area are dependent on a variety of livelihoods mainly connected with small-scale home gardens and plantation agriculture. Traditionally the area has been important for rubber and tea plantations and of course the kitul syrup that is tapped from the palm Caryota urens. In recent years tourism has become an important source of income for Kitulgala residents. The road between Nuwara, Eliya (via Hatton) and Colombo runs through Kitulgala and this is a major artery for tourist traffic. 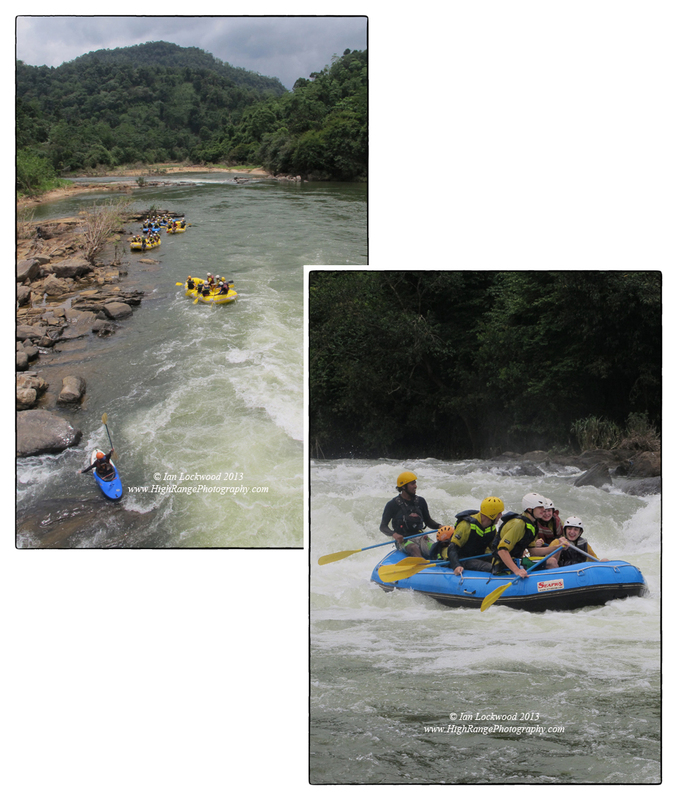 Kitulgala’s tourism is largely centered around the thriving white water rafting activities that first started in the 1990s. Other activities such as bird watching, abseiling, canyoning cycling and hiking have developed in the area. All of these are potentially sustainable, low-impact forms of tourism with no significant impact on the landscape. Most of the guides both on land and on the river are from the area and the activities have been a significant economic benefit to the Kitulgala community. The proposed Broadlands dam could potentially jeopardize this fine balance. 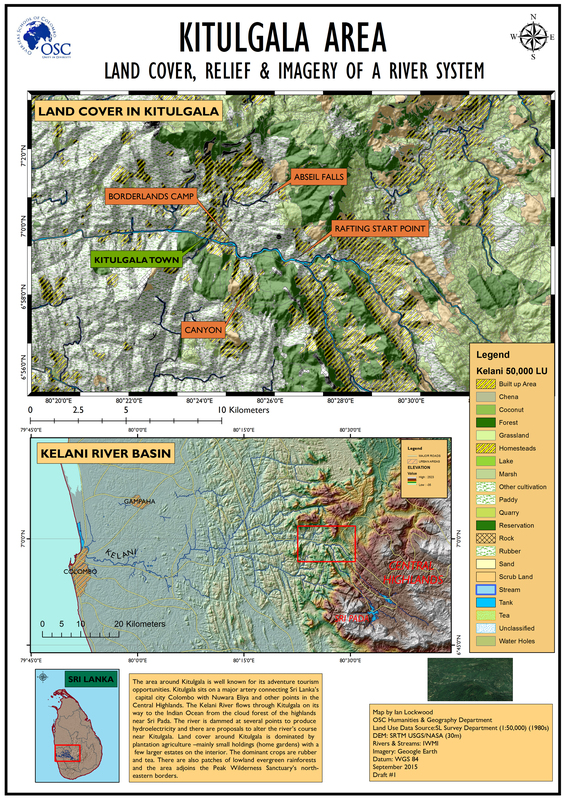 GIS generated Map of Kitulgala and Kelani River Basin created with SL Survey Department and NASA SRTM data by the author. Google Earth image looking at the Kelani rafting area and “canyon” from the south. Jayasinghe, Amal. “Broadlands power project will kill Kitulgala’s white water rafting.” The Island. 30 August 2014. Web. Kannangara, Nirmala. “Power Project To Dam White Water Rafting.” The Sunday Leader. 29 September 2013. Web. Lockwood, Ian. 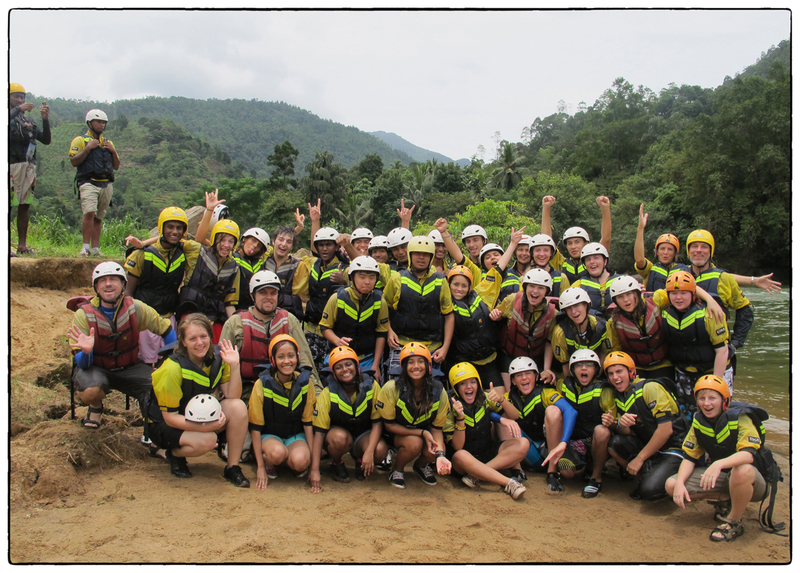 “Taking the Plunge in the IB Program.” Ian Lockwood Blog. September 2013. Web. Radrigo, Malaka. “War for water in Kithulgala.” The Sunday Times. 16 March 2014. Web. Back at ASB, after the morning visit to Elephanta, I enjoyed three invigoration days of thought- provoking demonstrations, workshops, lectures, interactions and talks at the ASB Unplugged. The workshops were crowded with 400 or so participants from across the globe and we were joined by the ASB staff, students and staff. The three days were split between student demonstrations, classroom visits and then “hands-on” learning institutes. The first day was capped with a Tedx talk. There were many personal outcomes that I got out of the conference: I relished learning about strategies for effectively integrating technology in my classroom, interacting with students about their personal application of technology in the DP and CAS programs and sitting in on several excellent interactive lectures by learned experts. It was difficult trying to choose from the myriad workshops but my choices of Larry Rosen’s Brain-Based Learning workshop and Suzie Boss’ Project-Based learning were just right for my own needs. It was good being part of a whole school team approach and the six of us OSC participants regrouped frequently to share learning and outcomes from various workshops. Our family friend Alok Parashar is ASB’s head of administration and we reminiscing about our years together on MUWCI’s distant hilltop. Interestingly, there were no geo-spatial workshops on offer and it appears to me that this is a key deficiency in the program that will perhaps offer an opportunity to address at the next conference. 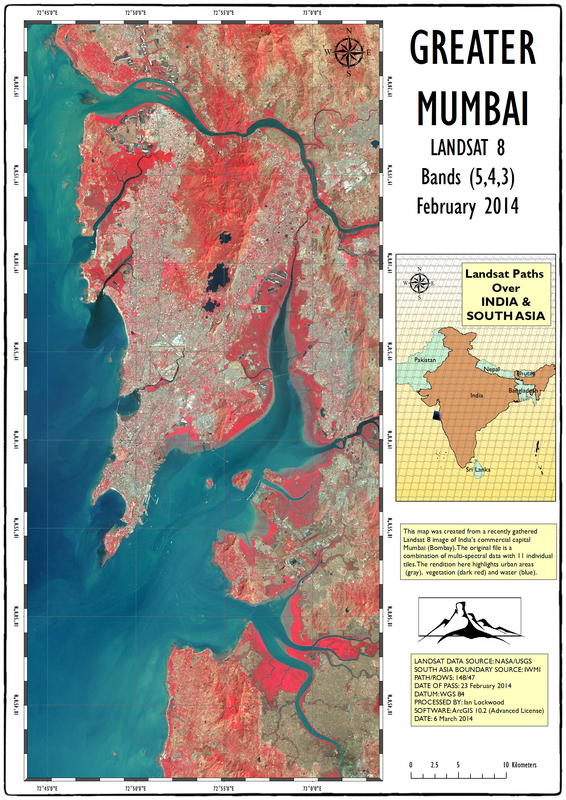 Thinking about this, I started the download of a Landsat compressed file of Mumbai (taken just five days earlier) from Earth Explorer on the first night. It has taken several hours of processing and has helped me rediscover this neck of India that I know well from a decade ago. The image above is the outcome of that process. 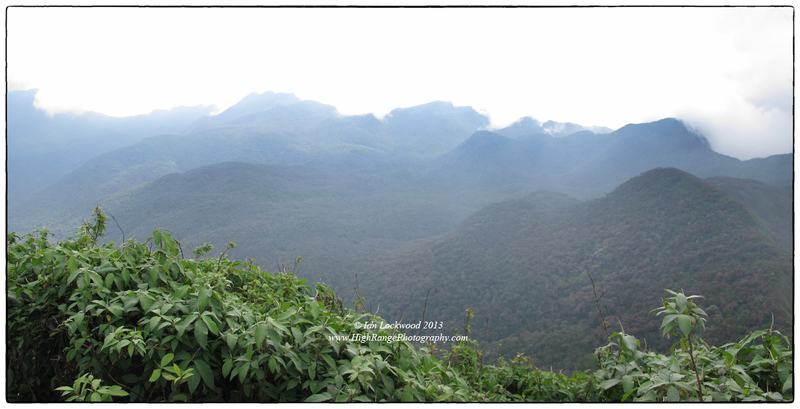 I have also started working with several other cloud free images from the Pune, Nashik and Ratnagiri areas. ASB is an impressive learning community and they are blessed with outstanding resources. Like anyone in Mumbai and other urban areas in India they face a challenge in the day-to-day reminder of extreme income disparities in society-something there are few quick fixes for. Perhaps what is most interesting to me is their singular focus on their mission and purpose. The focus on innovation and creativity at all levels of the school is something that many of us could learn from. The space and time given for students and teachers to apply learning in practical ways was energizing. ASB’s Superintendent, Craig Johnson, passionately articulated this in his welcome and concluding speeches. These were positive ideas to bring back with us to Colombo. What they didn’t have in Mumbai was the greenery, fresh air, island hospitality, spicy sambol and quiet neighborhoods that are a blessing to the OSC community and it was with happiness that I returned to my family in the eastern suburbs of Sri Lanka’s capital city! Scenes from a taxi window: the Bandra Sea Link, Banyan (Ficus benghalensis) growing on a Colaba buildings, and a Fiat on the newly opened Eastern Expressway. Future Forwards Exploring Frontiers in Education at the American School of Bombay. Mumbai: ASB, 2013. Web Link. Riebeek, Holli. “Why is that Forest Red and that Cloud Blue? How to Interpret a False-Color Satellite Image.” NASA Earth Observatory. 4 March 2014. Web. 5 March 2014. Sigiriya from the south as seen from Pidruangala on a damp, monsoon-soaked morning. 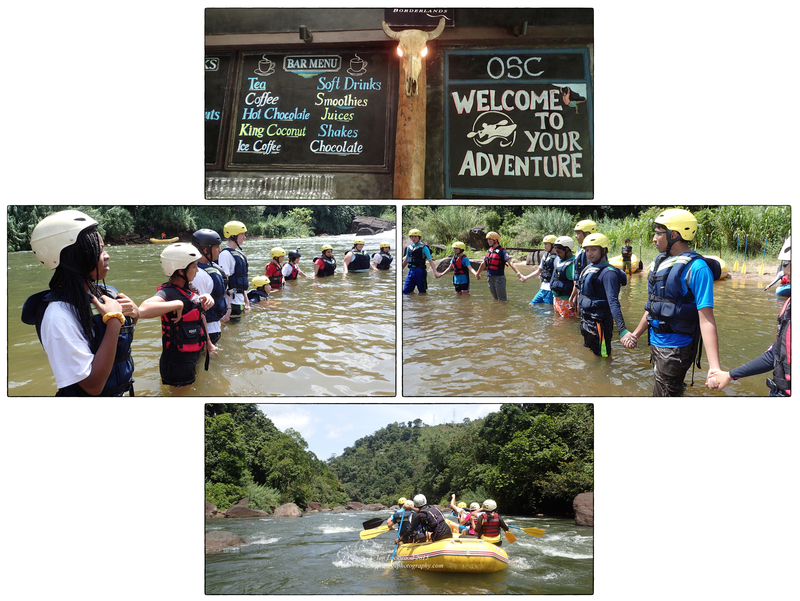 In the last week of January OSC’s students and teachers fanned out across the length and breadth of Sri Lanka to learn outside to the traditional classroom walls. The focus of these trips was varied and encompassed a number of curricular goals, outdoor experiences, service opportunities and explorations of our host nation. There were a wide variety of transport methods: buses, vans, a flight north and even bicycles. Students explored ruins of past civilizations, surveyed coral life underwater, slept in tree houses, helped out in Tsunami-affected communities, sampled bird populations in a rainforest, tweeted about Jaffna’s recovery, abseiled off of waterfalls and much more. The outcome of students and teachers electrified by their learning was clear for all to see at the conclusion of the trips and has been evident as we reflect back on the experiences and learning. 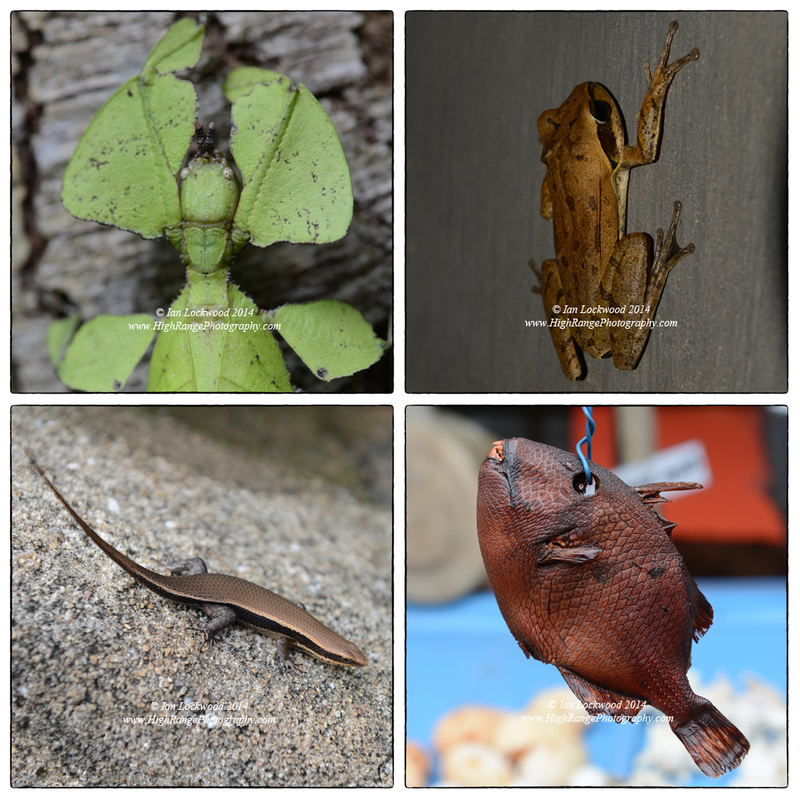 This year aside from coordinating the program I led a small group of students on what I called an exploration of Sri Lanka’s dry zone ecosystems. I was supported by Marlene Fert and we had eleven Grade 10 & 11 students on the trip. My idea was to expose the group to sites that blend culture, history and ecology off the beaten tourist track. We were based in the shadow of the rock fortress at Sigiriya and port town of Trincomalee. Originally we had planned to visit Pigeon Island, but the stirred up seas from the tail end of the North East monsoon made this impossible. My family and I had made two trips in preparation for this study trip (see blog posts from April 2013 and October 2013) and I wanted to was provide a similar, yet climatically different WWW experience to the Sinharaja WWW trip. Ironically we experienced a good deal of rain in the dry zone, but never enough to negatively affect our plans. Back of Beyond’s properties at Dehigaha Ela and Pidruangala provided the perfect place to be based at. They are both situated in serene dry zone mixed evergreen and deciduous forests, they have super staff that provide a home-away-from-home atmosphere, the accommodation (some in trees or caves) is beautifully earthy and there is (thankfully) only intermittent cellphone connectivity! While there we took a day trip to Ritigala Strict Nature Reserve and a night walk in the Popham Arboretum. In Ritigala we explored the ruins of monastic communities and other evidence of past civilizations. Biodiveristy, both living and dead, seen on our visit. A highlight was visiting two archeological sites that both host important Buddhist vadatages (relic houses) and other significant sacred ruins. Medirigiriya is an impressive site with nearly two thousands years of recorded history. It sits off the main Habarana- Polonnaruwa road and is free of tourists. North of Trincomalee is the ancient Jaffna kingdom port of Thiriyai with a very old and important Buddhist vadatage set on a low hillock amidst mixed evergreen and deciduous dry zone forests. Thiriyai was apparently it is the “Thalakori in the 2nd century AD map of Ptolemy” (Wikipedia). Images from these sites will be highlighted in an album in the next post. Here is the poster (below) that I put together for the WWW exhibition held on 20th February 2014. 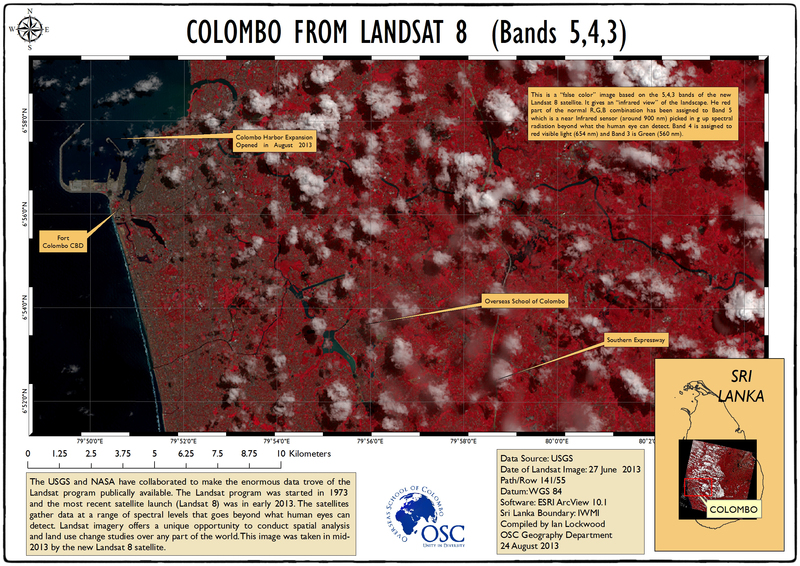 The Landsat imagery is much more recent (from the week after the trips came back). WWW Exhibition Poster (originally A1 size with 300 DPI)/ Reduced to 72 dpi here. Fernando, Nihal et al. Stones of Eloquence: The Lithic Saga of Sri Lanka. Colombo: Studio Times, 2008. Print. Raheem, Ismeeth. Archaeology & Photography – the early years 1868 -1880. Colombo: The National Trust of Sri Lanka, 2010. Print. 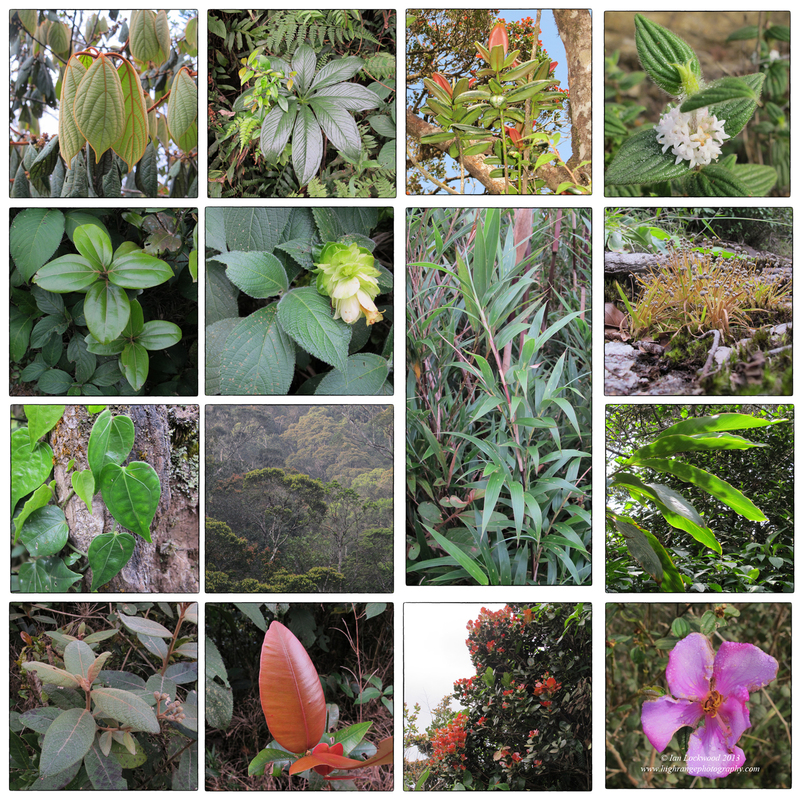 Collage of snapshots of native flora on the forest trail to Sri Pada’s 2,243 meter summit. 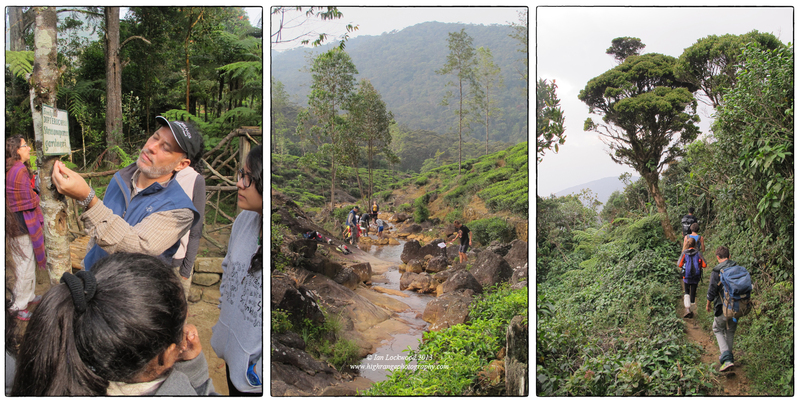 Every December it is my privilege and pleasure to lead a group of DP I (Grade 11) OSC students up the slopes of Sri Pada in order to study the mountain’s ecology and appreciate its value as a stronghold of biodiversity in a rich Sri Lankan cultural landscape. This year I invited the DP Biology class and their teacher Tim Getter to join our group of eleven DP ES&S students. We were supported by our teaching colleagues Sonalee Abeyawardene and Celine Dary (so there were added opportunities to explore ideas of pilgrimages in literature and converse in French during our three days out!). Several students had just completed a heart-pounding SAISA tournament in Muscat and hopped from their airport bus onto ours as we headed up into the Central Highlands on a clear Monday morning. Vertical zonation studies of floral diversity on the forest path to Sri Pada (center and right) and degraded forest near the Fishing Hut (left). Max, Chadoo and Teresa laying the transect and looking for plant diversity. The Moray Estate Fishing Hut#1. 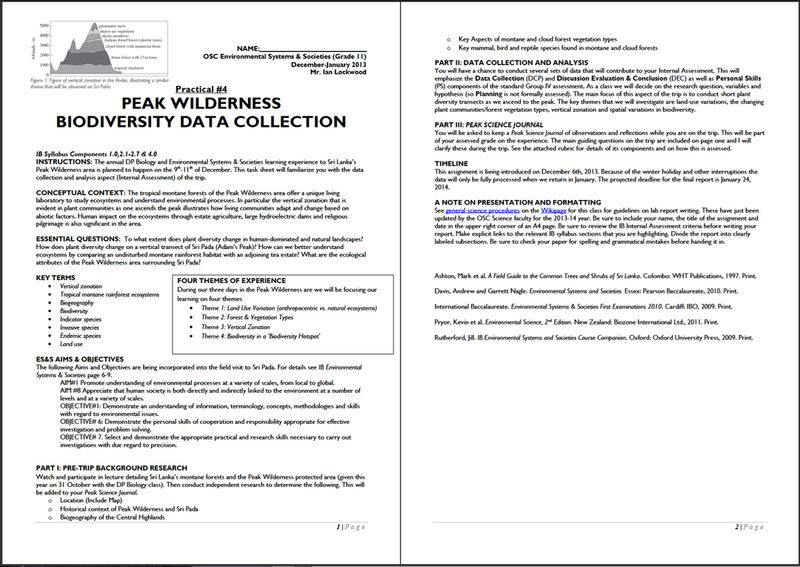 ES&S task sheets from the 2013 Sri Pada learning experience. A contrast in habitats: a monoculture landscape of tea and non-native shade trees overshadowed by undisturbed sub-montane tropical rainforest in the Peak Wilderness area. 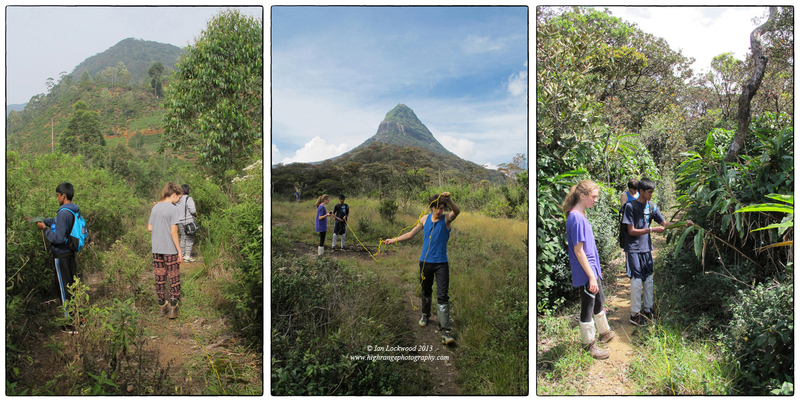 Appreciating abiotic factors and the role of decomposers: snapshots from the study on the slopes of Sri Pada. Our main study day was on Tuesday December 10th (my brother Brian’s birthday!) when the ES&S class ascended the peak. Based on the fitness and gear that the group, I decided to make it a day trip and not spend the night on the top. We went with light packs for the day and were able to conduct a series of line transects as we gained altitude on the peak. The idea was to observe and record changes in plant diversity as we traversed human and natural landscapes and gained altitude on the peak. 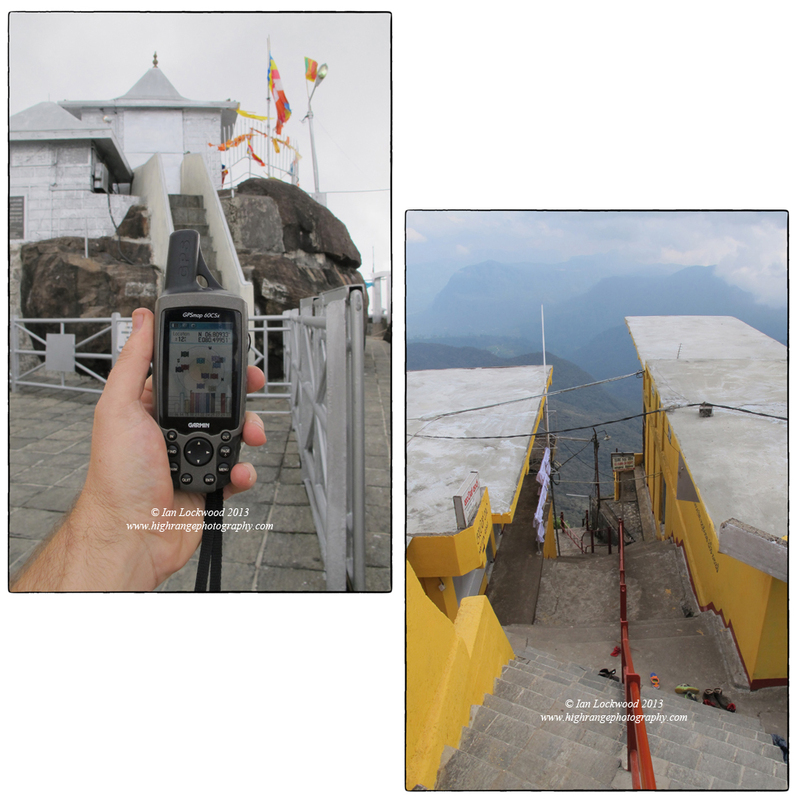 I had decided to leave my heavy camera gear in Colombo and was armed with a lightweight Canon Powershot, GPS and small temperature probe. The small allowed me to take quick snapshots of the wealth of plant life on the forest trail- and the detail isn’t too bad. Because the hike is physically demanding, there was little time to linger but the group managed at least five transects at different elevations and habitats. We got to the temple around 1:00 –it was pleasantly empty as the season was still a week away from starting. Our lunch of peanut butter and Nutella wraps was shared with a wandering Australian, we rang the temple bells, appreciated the summit temple and then headed back down. One of the students- Max who had been in Muscat playing football for OSC -had a sore knee and we took the last bit slowly. This facilitated a meandering conversation and time to observe the forest much more closely. It was dark by the time we got back to the Fishing Hut. 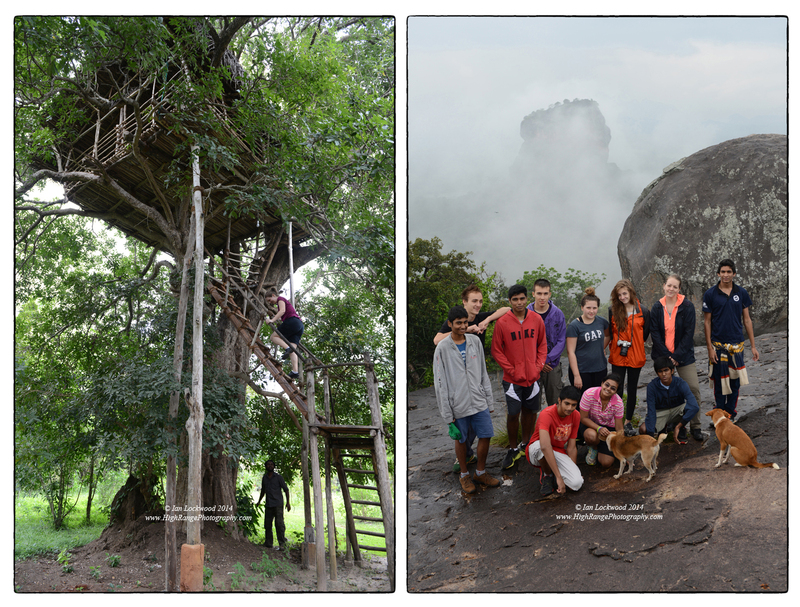 Snapshots of the OSC Biology class and their teacher Tim Getter in action. On the right, the ES&S class descends from the Peak through sub-montane tropical rainforest. On the final morning we were able to look at a patch of degraded forest and a eucalyptus plantation. These habitats offer a fascinating contrast to the sub-montane forest. There are numerous invasive species colonizing these disturbed areas but also a gratifying number of native species also making a start. 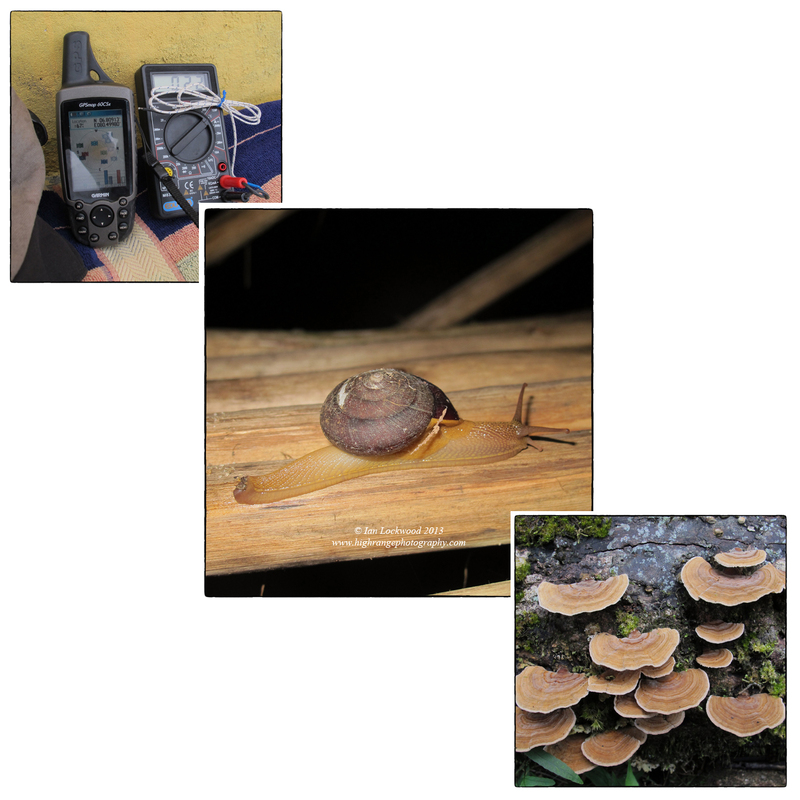 Down below us the biologists completed a biotic index study of two streams (one from the forest and one from the tea estate). We were moving back to Colombo by 10:30 and school wrapped up two days later. Now, as we begin a new term, the classes will be sifting through their data, science journals, photographs and memories to consolidate their learning on Sri Lanka’s sacred mountain. 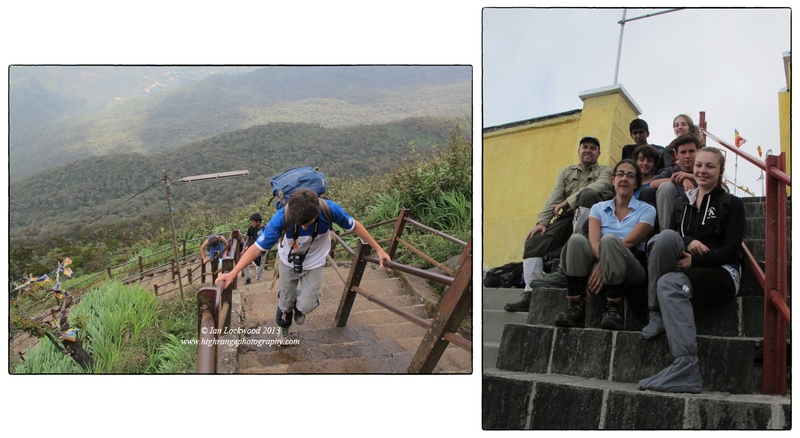 OSC’s ES&S students on the last steps and then summit of Sri Pada. Looking over the Peak Wilderness area to the east and south of the peak from the summit temple. The Fishing Hut and Moray Estate is on the far left. Scenes from the Sri Pada temple area. This was a week before the pilgrimage season officially opened up and the temple area was serene and quiet. Sunset over Sri Pada. Taken on Monday December 9th after a cold stream traverse. Every August in the midst of the South West Monsoon new batches of students enter OSC’s IB Diploma Program. We are a relatively small school and usually have cohorts around 30-35 students from a dozen or more countries. For the next 18 months these young women and men will undertake a series of academic, extra-curricular and personal challenges. There are significant peaks and troughs and the exercise culminates in rigorous exams that are assessed alongside thousands of other students worldwide. In addition to six subjects divided between three higher level and three standard levels subjects, they write an extended essay, participate in the Theory of Knowledge class and take part in the Creativity Action and Service (CAS) program. For many the goal is university entrance but there are basic skills in being a human being in an increasingly interconnected, sometimes perplexing world that are just as important. It is a daunting challenge for even the most organized, brightest and/or hardest working individuals and yet our students do amazingly well. In order to prepare them for this exceptional learning experience, we conduct an orientation program that emphasizes team building, leadership and experiential education using the outdoors. The program is facilitated by Borderlands Sri Lanka at their Kitulgala base camp. The idea is to give OSC’s students a sense of the DP, highlight a few keys components and help them to take the plunge both metaphorically and in the flesh! 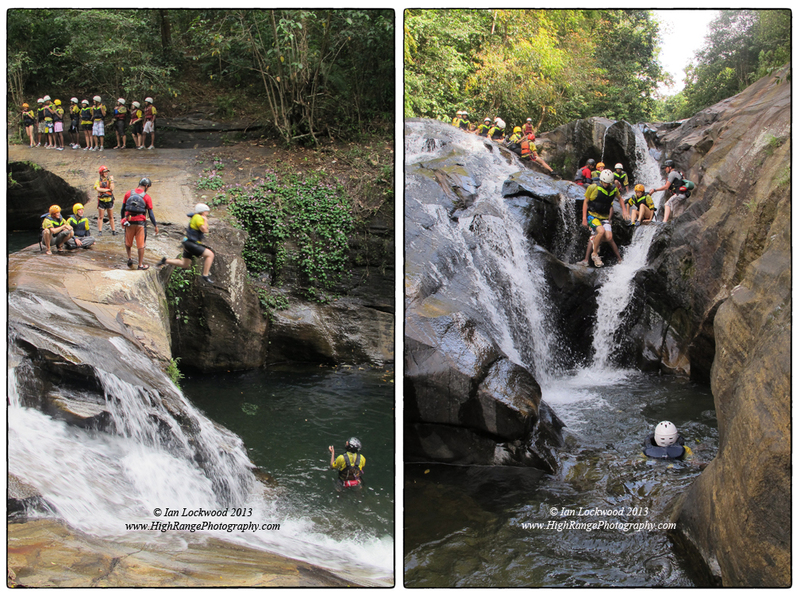 Much of the program involves physical challenges set in the wet, densely forested Kelani River valley. The river, originating on the slopes of Sri Pada, runs through the small town of Kitulgala located about 100 km due east of Colombo. Water and the river play a key role as students and teachers raft and canyon their way into the camp on the first day. The team at Borderlands has an impeccable safety record and time is taken to emphasize safety in the different spheres of the challenge. Some of the students have been here on past school trips or with their parents but a few came with limited swimming skills and were nervous about the challenge. We rafted through a series of rapids, took time to play in the river and then made our way through a gorge (“the Canyon”). By the end of the first day the team was exhausted, but exhilarated from the river and canyon. We took time to reflect on the day both as a group and individually. This is where CAS came in and the four step learning cycle (plan, act, observe, reflect) was emphasized. 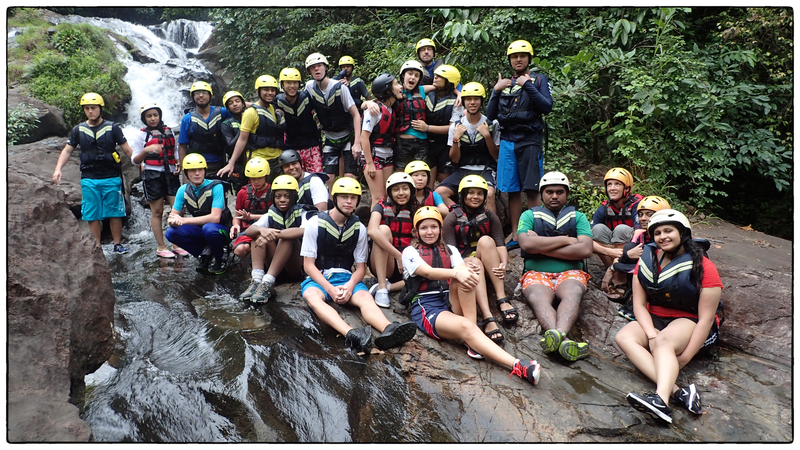 OSC’s Class of 2015 Rafting the Kelani River. Abseiling in heavy afternoon rain. 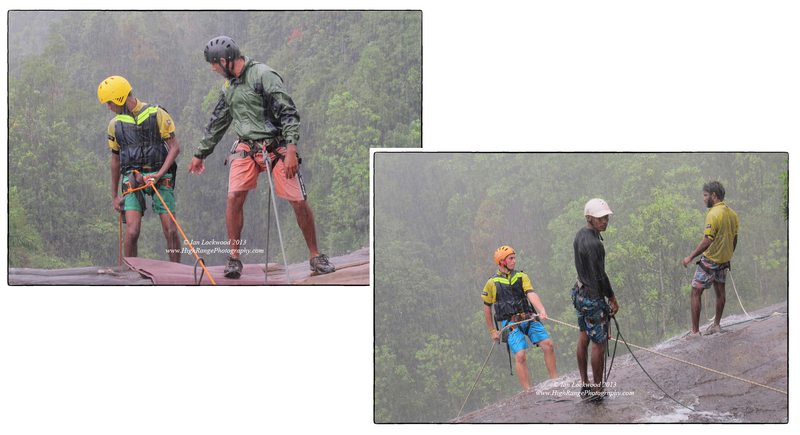 Borderlands instructors Mahesh and Nirmal guiding OSC students over the edge. Learning to think about knowledge in Belilena Cave. The Theory of Knowledge component of the orientation program is set in the historical Belilena Cave located amongst rubber plantations above Kitulgala. This is a significant Sri Lankan archeological site and is thought to be one of the oldest locations showing evidence of early Homo sapiens in all of South Asia (estimates range from 12,000 to 30,000 years before present)! The setting is sublime to say the least and the echoes of Plato’s Allegory of the Cave ring loud in this setting (a link pointed out by OSC’s mathematics HOD and philosophy junkie last year). The students were invited to think about knowledge and test their senses as they grappled with a series of cognitive challenges. 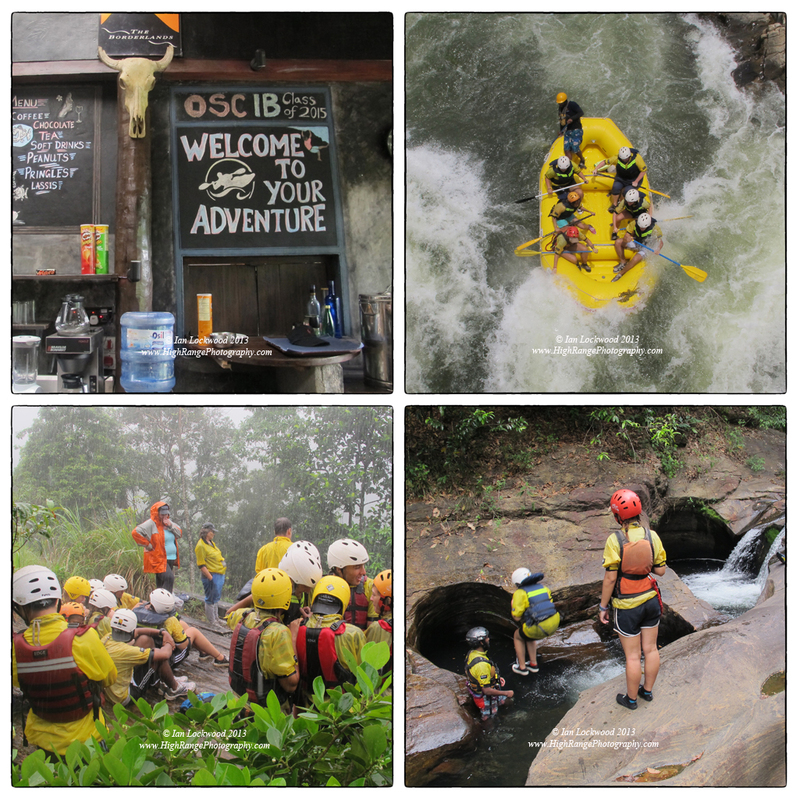 In the second part of the afternoon the tasks were much more physical and the class hiked up to a 100 meter waterfall to be tested in a slippery abseil in an intense downpour. The sense of accomplishment and elation at the end of this was palatable. Waterfall on Belilena Cave with OSC students exploring the meaning of knowledge on a monsoon soaked day (taken on IB Orientation 2012). Top of “the Canyon”…taking the plunge. Making our way through “the Canyon”…following the stream over a series of falls and through pools and gorges (note the Impatiens sp. on the wall!). On our final day we explored ideas of community in the changing landscape. Students broke into small teams to meet a cross section of local inhabitants and talk to them about their memories, experiences and dreams of the river. This is a new initiative and will hopefully lay the ground work for follow up work when subsequent OSC classes return here. We returned to Colombo exhausted, slightly bloodied by leeches but exhilarated by the experiences of taking the plunge into the IB Diploma Program. Posted in Around Sri Lanka, Education, IB CAS Work etc. Several developments in data accessibility and technology have helped launch a popular revolution in the use of remote sensing technology. The Landsat program run by NASA and the USGS has had a series of satellites orbing the earth since 1973 and has recently put its entire 40-year archive in the public domain. What this means is that students, teachers, scientists and citizens can now access detailed imagery of anywhere in the world to analyze vegetation, land cover and change. This has interesting implications for teachers and students in the International Baccalaureate Diploma program. Remote Sensing (RS) and Geographic Information Systems (GIS) is not formally a part of any IB Diploma subjects. Anyone pursuing geography at the tertiary level will have to have GIS skills, but this has not been incorporated into the teaching requirements. The Geography, Environmental Systems & Societies and Physics courses, all have opportunities to use these technologies to address key concepts and learning outcomes. In DP Geography GIS is a useful tool in building geography skills (core 1.0) and the Urban Environments option. I teach basic GIS skills to all of our Geography students for them to use in the Internal Assessment as well as areas of the core syllabus (populations in transition etc.). We are also working in the OSC Humanities department to introduce basic GIS mapping skills at an early age. Despite GIS & RS only playing a minor role in the syllabus, they are showing up in final assessments. 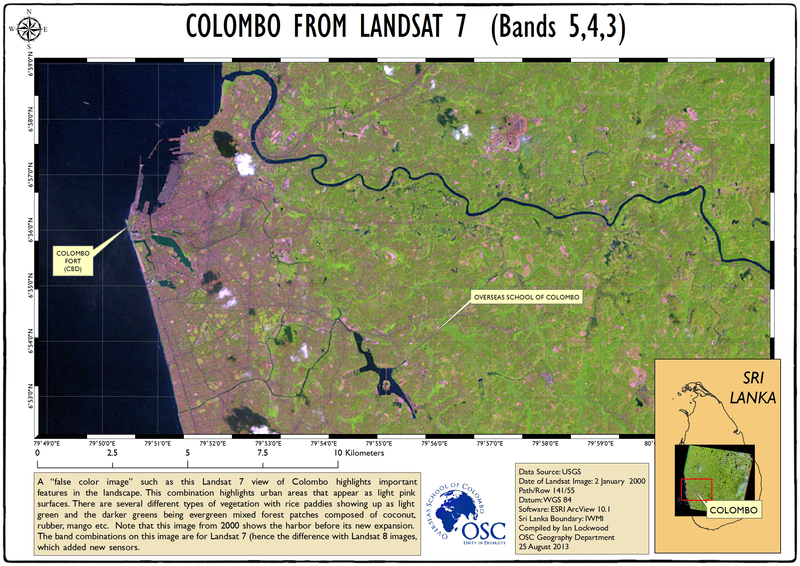 The May 2012 IBDP Geography exam question, for example, featured a Landsat image of urban growth and sprawl in the Pearl River delta taken from the NASA Earth Observatory. This year we have acquired two Vernier ALTA II Reflectance Spectrometers. I was exposed to the use of these while at the JOSTI workshops at Thomas Jefferson School for Science & Technology last summer. A highlight for me -and I was the only participant – was taking the Remote Sensing workshop with Lisa Wu and Shawn Stickler. They run courses in Geosystems and Oceanography which both utilize GIS and RS applications. Students at TJ are actively involved in the design and usage of their data gathering equipment. One of them had completed impressive work in the Chesapeake Bay interpreting temporal data using Landsat images combined with ground truthing trips. 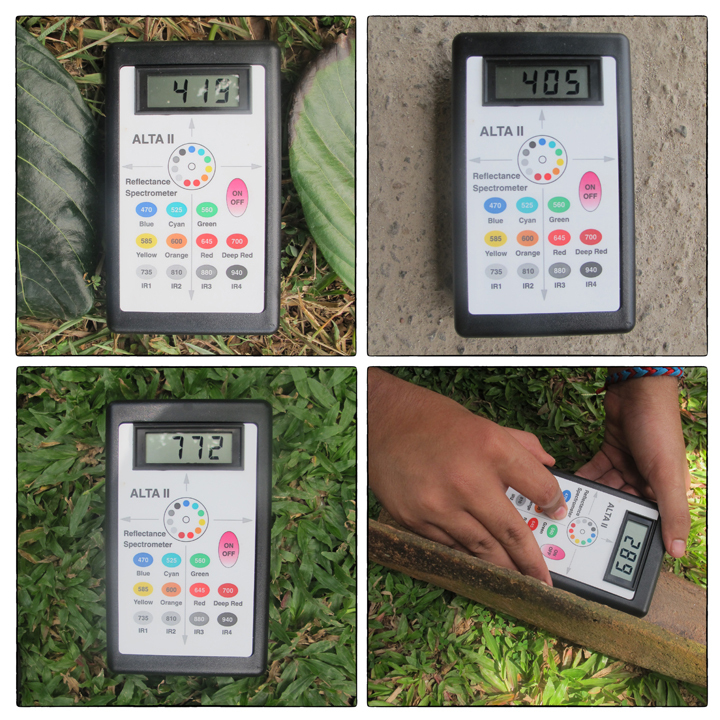 The Alta II meters are relatively simple gadgets that measure the reflectance of different colors from a given surface. The meter operates by shining a small LED light (from Deep Blue up to Deep Red and Infrared). A photo sensor records the amount of light bouncing back into the meter. The value that the meter gives is then divided by the particular color’s wavelength (in nm) minus the “dark value” (value of meter when no color buttons are pushed). So it does take some simple division to actually arrive at the reflectance percentage once you have your readings. These can be graphed (see jack example blow) and then compared to standard values. I ran an initial trial using mango (Mangifera zeylanica) and jack (Artocarpus heterophyllus) tree leaves. The next week our Grade 12 students conducted a similar test on a variety of surfaces as a part of their IB Group IV project. Reflectance is quite consistent for various species but there would be variations based on the age of leaf (which is why I took values for two different jack tree leaves). NASA has a helpful online spectral calculator for looking at reflectance values of different species in North America. What is interesting is to use the reflectance meter to corroborate or ground truth reflectance values of surfaces that are visible in the Landsat satellite imagery. The normalized differential vegetation index (NDVI) has also become a standard test run using RS images. It measures a value of vegetation in a given area and this can then be compared to the same area at other times. The Earth Observatory has a clear explanation of the NDVI index. India’s Aligarh Muslim University also has an excellent article on reflectance that is worth looking up. In the coming months my students and I will be working to make clear linkages between Landsat imagery and the values that they are collecting in our area. Reflectance readings from two jack fruit leaves (one old and one new). OSC students collecting reflectance data on a traditional tile at the craft village, The above image shows the meter over a mango leaf. The value is a dark value (here with considerable light pollution from outside). If you are looking to access the Landsat Program the best point to start is the USGS Earth Explorer (this is better achieved using a browser enabled with Java). Earth Explorer has a wide range of spatial data available and it is worth exploring all the many different data sets. Another point to access basic spatial data from Landsat (without having to process it) is the Terralook site. You can also use the Glovis Site (that I had recommended in my post a year ago). When I am working with Landsat data I download full GeoTif files from Earth Explorer and then work with the different tiles using ArcCatalog and ArcView (Desktop). Having a fast Internet connection is essential for this. 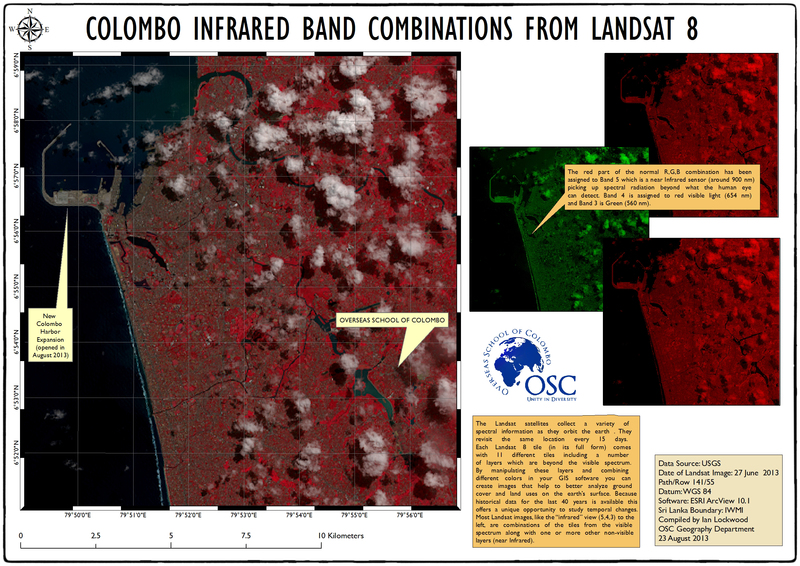 I have started a page on my Mango Wiki site to help my students access Landsat data and instructions that are available online. A very useful manual to have is Remote Sensing for Ecology and Conservation authored by Ned Horning and several others at the Center for Biodiversity & Conservation at the American Museum of Natural History. For a portfolio of images taken from space and clear explanation of the way satellites gather multi spectral data see Andrew Johnston’s Earth From Space (Smithsonian National Air and Space Museum, 2007). The Alta II reflectance spectrometer meter is available through Vernier in the US and comes with a manual of lessons plans. It does not plug into the Lab Quest devices that most science labs are using.